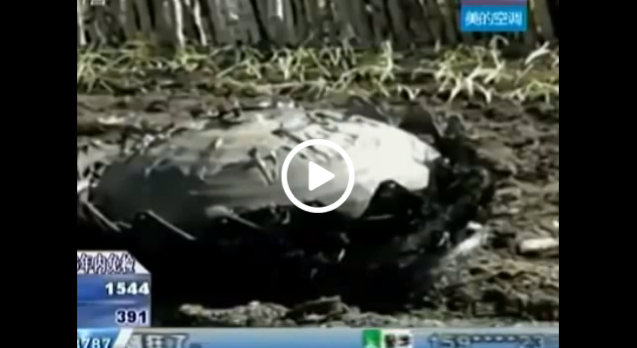 Video- Three UFOs Crash In China. Villages in the province of Heilonjiang, China reported seeing strange objects falling from the sky last Friday morning, according to the China News Service. The objects were not astroids or meteors, they were large circular objects that clearly were made out of metal. The objects came crashing to the ground after “villagers heard… a huge piercing sound, and then some villagers saw a big fireball.” The wreckage was found to have crashed into a vegetable garden that is owned by one of the villagers. The objects were described as being about 2-and-a half-feet wide and weighing around 90 pounds. The silver-gray objects also had jagged edges and burn marks. Investigators are trying to determine what these objects are and how they crash landed in China.